We may have had weather which has led to wide scale heartbreak and the never ending recession, but on the whole things have seemed fairly bright and optimistic this year. Certainly Taste the Cracklin’s hog roast team in Swindon has been riding high on the back of some big events and brilliant people. Over the past couple of weeks there has been a bit of excitement in the office over who is going where and when. Myself and a couple of the catering staff had been pencilled in for a wedding in Chippenham, but eventually we had to go a little further a field to a swanky hotel party out near Cheltenham. This wasn’t so bad but this was a big party with a big food order. Normally, since I started at Taste the Cracklin in Swindon, we usually take out one or two machines, possibly three for contingency, but for this corporate end of summer party we had to take four machines just in case. 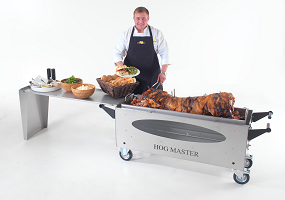 This is around the point when I suggest that if you enjoy the food at one of the events we put on, why not hire out a machine for your smaller parties, hog roast hire Swindon makes this affordable and simple. But I really would suggest if you are going to have a massive event give us a call and we can help with all the catering and service. With corporate hospitality for over three hundred staff we had a lot of prep to carry our before we could even think about getting over to the hotel. Sourcing the meats is usually easy with all local connections we can usually get the prime cuts of meat for lamb or beef. Chicken, pork and barbecue was on the menu for this event and so we had a mammoth order to stock up with. The Professional and Titan machines we used for this weekend are able to cook two styles of food so we were able to cook some of the barbecue ribs, burgers and speciality sausages whilst cooking the chickens on the same bit of kit. Something that you can easily do if you decide to hire from us. Saturday morning was a pretty decent day for once so after the initial darkness had given way to some watery sunlight, we had already started to get the meats roasting in time for the guests arriving. Despite so many people on the day it was a pretty informal do, we set up serving sections for people to choose their roast of choice – obviously most people head straight for the spitted pig – but there was plenty of choice for vegetarians and loads of side dishes for those who need more than just meat. Considering how long we were serving for I think our hosts were more than satisfied with the offerings. The apple sauce was particularly popular and a number of people came back to finish off the crackling before we packed away for the evening. The hotel guys were more than happy to help us out with the leftovers and so we didn’t have too arduous a task for clearing up. It was a cracking day and I think we will get asked back by the hotel for some of their parties early in the New Year -which really shows just how popular this style of catering is becoming. That reminds me – with Halloween just around the corner and Bonfire night too– soon it will be Christmas – which is a bit of a scary thought. Taste the Cracklin will be celebrating this year after a really good year for us. And if you want something really different this Christmas – why not try hiring a machine from us. I think you would get some real kudos from the family for that little treat. With plenty going on when pig roast Swindon style is catering over the next few weeks you wouldn’t know that summer has been left behind and some of the autumnal pleasures will be celebrated up and down the country. We have a Ceilidh and a couple of anniversary parties over the next month before one of our busiest periods – some chilly outdoor bonfire evenings. But what could be better for you than a hot sticky hog roast bun slathered in apple sauce.